We are organizing a mega sports event “Chennai Olympics 2011” for children with Special Needs on March 12, 2011 at YMCA, Chennai. AIKYA is an organization dedicated to promoting Sports for Children with Intellectual Disabilities as one of the objectives and has organized similar events earlier and the guests have been prominent sports persons like Krishnamachari Srikanth and Mr.Vijay Amrith Raj. AIKYA is dedicated to the educational needs of children and young adults with with Autism, ADHD, DS and Learning Disabilities. Lions Club of Padi Shenoy Nagar is a service organization well known in the city for their services for several decades. Chennai Olympics is jointly organized by AIKYA, L.C.Padi Shenoy Nagar and North Chennai District Parents Association. Chennai Olympics aims to empower children with special needs through Sports. IT USED to be that when a little boy or girl is too aggressive and hyperactive, or too timid or not interactive enough, parents would dismiss this as just part of the child’s developmental years. But what if the hyperactivity becomes too annoying or the non-interactivity becomes too alarming, when should a parent worry? Despite recent studies released publicly on developmental disabilities that affect children, parents remain clueless on the red flag signs that their child is indeed suffering from a developmental condition. Among the most prevalent conditions today – Autism and Attention Deficit Hyperactivity Disorder or ADHD – continue to challenge not only the children suffering from them, but more so their parents who are at a loss as to how they would help their children cope with such developmental conditions. "The challenge to help children with autism or ADHD live quality lives depends on their parents. By learning about their child’s condition and the latest treatments available today, and giving their full love, understanding, patience and support to the child, individuals with autism or ADHD can even become productive citizens of society." Among the red flag signs of Autism that parents may observe are as follows: Lack of warm, joyful expressions by six months or thereafter; no back-and-forth sharing of sounds, smiles, or other facial expressions by nine months and thereafter; no babbling or back-and-forth gestures like pointing, showing, reaching or waving by age 12 months; no words by 16 months; no two-word meaningful phrases without imitating or repeating by two years old; and loss of speech or babbling or social skills at any age. Autism is described as a neurodevelopmental condition characterized by impairment of verbal and non-verbal communication, reciprocal social interaction and imaginative activity. Signs of ADHD on the other hand – which is characterized by inattention, hyperactivity and impulsivity – include lack of focused attention or showing more interest on exciting graphics, bright colors, or flashing lights; general lack of self-control and accident proneness; difficulty in turn taking during play; restlessness; and excess overt motor activity such as excessive talking, humming or making noise. Such red flags can be overwhelming for parents, but it is extremely important to recognize that the child might need medical help rather than succumb in denial and extend punishment on the child or letting him be absorbed in his own world. : "There’s no specific cure but there are treatment and intervention program options available to help children with autism or ADHD cope with their condition. Studies show that outlook for most children who receive treatment for ADHD or autism is encouraging, especially if intervention programs are started early enough. Many of us have felt the magic of yoga.,the powers of yoga and I personally have learnt and practice Yoga..Knowing the benefits of Yoga, I tried to use Yoga as therapy to my special kids at AIKYA for whom I have dedicated my life.We were quite successful in teaching them the asanas.The benefits were huge. Our experiences over the last 19 years teaching yoga to special kids has been extremely rewarding. Students of AIKYA perform a series of balanced Yoga after training in Yoga and it is unbelivable to watch the most hyperactive kids performing difficult asanas with ease at stage. Many of the students with special needs have one or many sensory deficits. They have difficulty integrating the information from their eyes, ears, hands, and body. They may not move easily and appear clumsy. Most learning problems are the result of poor sensory integration of all these systems. Each child demonstrates a different set of symptoms. Their nervous system is working an irregular way and they tend to have disorganized response to their environment. 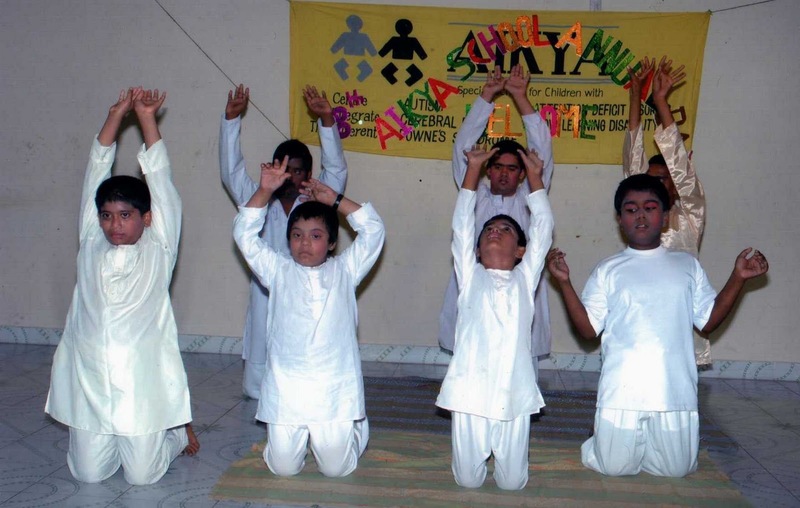 We have integrated yoga into the sessions of children with various diagnoses with positive results. Anyone can maximize his or her potential from consistent practice of yoga and these children are no exception. Yoga calms the physical body and once that occurs, the mind can quiet. Gradually, a child becomes more organized and focused. Yoga enhances flexibility has a positive effect on gross, fine, visual motor conditions. It also promotes strength and self-esteem and encourages a gentle spirit. Why do persons with disability need to be counted? For decades after our independence, there was no serious effort to actually count how many of us have any disability. As we know, all our government's plans and budgets, rules and regulations and policies are built upon the census data. It is therefore inevitable to have factual figures about the number of persons with disability to demand for their due share in government development progammes. The first time that persons with disability were seriously included in the census was in the year 2001 and it showed that 2.13 per cent of India’s population has a disability. This is against the estimated figures by the World Health Organization (WHO) - anywhere between 5-10 %. In the forthcoming census 2011, the government of India has promised to enumerate the persons with disability with more accuracy and with broader definition. Let us join together for this noble cause and ensure that each person with disability is counted. When is the population enumeration? Local schoolteachers or Anganwadi workers or ANMs (Auxiliary Nurse Midwife) will be visiting your family to count family members. Is there a separate question to enumerate disabled persons in the census survey form? Yes. In the Census form Question No.9 is exclusively meant for the person with disabilities. However, it is to be noted that all the 30 questions in the census form should be answered by family members also having persons with disability (who live in that family) in mind. Is it necessary to produce proof to verify my disability? Govt. benefits do not apply here. How is the census information used by the Govt.? provided by the citizens of India in the Census is strictly confidential by law. If any one has any grievance in the Census process he/she should contact the state Census Officer.